Tivola Publishing has released Grandpa and the Zombies on iOS and Android devices, challenging players to help wounded Grandpa Willy escape from a zombie-infested hospital, using nothing but his wits and his wheelchair. Each level comes with candy to collect, but players can roll on through by simply making their way to the exit. Grandpa and the Zombies comes with 90 levels at launch, across three main locations: the hospital, a warehouse and a crypt. Each level is displayed from a top-down perspective, and gamers swipe to send Grandpa Willy rolling in their chosen direction until he hits a wall or other obstacle. Zombies mirror Grandpa’s movements, and can be killed when players send them outside of the maze’s exterior wall. While many zombies are evil, some wrapped “mummy” zombies are actually helpful, stopping Grandpa from rolling too far. Players need to avoid or utilize the game’s different kinds of zombies to collect up to three pieces of candy in each stage, and eventually reach the exit. Players can repeat stages to collect missed pieces of candy or simply increase their high score, and a premium hint system shows each move to take to earn all three pieces of candy and complete a level in a step-by-step fashion. 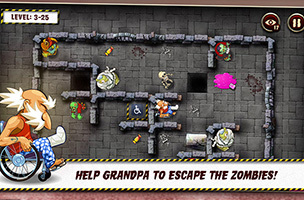 Grandpa and the Zombies is available to download for $0.99 on iOS and Android. Bundles of hints are available via additional in-app purchase. Check back soon to follow Grandpa and the Zombies on AppData, our tracking platform for mobile and social apps and developers.